› TicketIQ › 2018 Masters Ticket Prices - Where's the Tiger Effect? (UPDATE: 4/5) With Tiger Woods in the field at the Masters for the first time since 2015, it would seem that ticket prices would be soaring. While the price of a weekly badge is up, daily 2018 Masters tickets are mostly down, according to TicketIQ.com, suggesting that the Tiger era has ended and that professional golf as a game has transcended a single player. TicketIQ.com data shows that the average asking price for a weekly badge is $,7,684, making it the second most expensive behind 2013, when badges were at the highest of the decade at $9,267. Tiger finished T4 in 2013 after finishing T40 the previous year. The tournament begins Thursday and Woods has a 10:42 a.m. tee time and will play with Marc Leishman, Tommy Fleetwood. That $7,684 marks a more than 100 percent increase over last year ($3,722). An interesting side note to the weekly badges is demand — only 10 weekly badges remain in inventory on the secondary market, by far the fewest since 2015 (8). Last year, there were 16 remaining and in 2016, there were 47. Those numbers were significantly higher than they had been previously, so it appears demand is on the ride. In 2013, only six badges remained, the lowest in seven years. If you’re interested in snagging a single-day ticket, secondary market average asking prices are, on average, down 5.2 percent, according to TicketIQ.com. The highest average asking price is for Sunday, at $2,780 and the cheapest is $1,852 for Saturday. The Sunday price is higher than 2017 ($2,562) and the most expensive since TicketIQ.com began tracking Masters data in 2012. The Saturday asking price is down nearly $400, compared to $2,266 last year. Despite the dip, Saturday’s current asking price is the third highest since 2012. A $2,049 Saturday ticket in 2013 was the second highest. On average, single-day tickets, including practice days, are down from 2017 — $1,808 against $2,461. Even with the decline, this year’s average is the third highest of the decade, behind 2017 and 2016 ($2,068). Without practice days factored in, the average asking price for single-day tickets this year is $2,458, second behind last year ($2,593). The single-day average has only crossed the $2,000 barrier twice before, when it reached $2,177 in 2016 and and $2,162 in 2013. Woods, who is making a return to playing a full schedule after having back surgery in September 2015, has won four Masters (2005, 2002, 2001, 1997). He has played in six tournaments dating back to November 2017, and finished second at the Valspar Championship in March. (UPDATE: 3/16) Prices for Masters Sunday 2018 are up 11% since Tiger Woods came up just short of winning the Valspar championship last last weekend. Now that Tiger is again the favorite to win another green jacket, it may be time to start thinking about how high prices could do. For Sergio Garcia's run last year to his first major championship ever, prices went up 71% for Sunday over the course week. If ticket prices went up this year at the same 71% rate for Sunday this year, the average would be $3,200, and the highest Master single day price TicketIQ has ever tracked. While Sergio was the biggest Master win since Perhaps Tiger's first, fans would likely to pay up even more to see Tiger complete his comeback. While the earlier days wouldn't see as much of a spike, if Tiger is in the hunt into the weekend, and prices rise 25% across all sessions, it would mean an average average for 2018 (w/o practice) of $3,250. That would 400% higher than Master Sunday 2014 which was the Master without Tiger Woods. Maybe Tiger Woods really is back. After being one of only 12 players to finish at par or better at the Honda Classic last weekend, the odds that Woods will win his fifth Masters improved to 16-1. Tiger, who won the fourth of his green jackets in 2005, has only teed it up at Augusta once since 2013. But his T-12 finish – eight strokes off the lead at the Honda – was enough to get gamblers excited and for odds makers to move the line. Justin Thomas won the tournament, beating Luke List in a playoff. Woods finished at even par. According to GolfChannel.com, when Masters odds were first released in August 2017, Woods was a 100-1 shot. Just two weeks ago, the odds had dropped to 25-1. Woods still isn’t favored to win the tournament. Dustin Johnson is the current favorite at 7-1. Every time Woods plays, the crowds come out, so no one is happier than the men in the green jackets that Woods, who is trying to fashion a comeback from various back injuries, has The Masters on his radar. "I'm just trying to build towards April," Woods said in a press conference at Torrey Pines in January. "...I'm looking forward to playing a full schedule and getting ready for the Masters. That's just been my schedule and my outlook from '96-on ... to try and get ready for Augusta, and there's no reason to change that." Woods has played in three PGA Tour events so far in 2018. 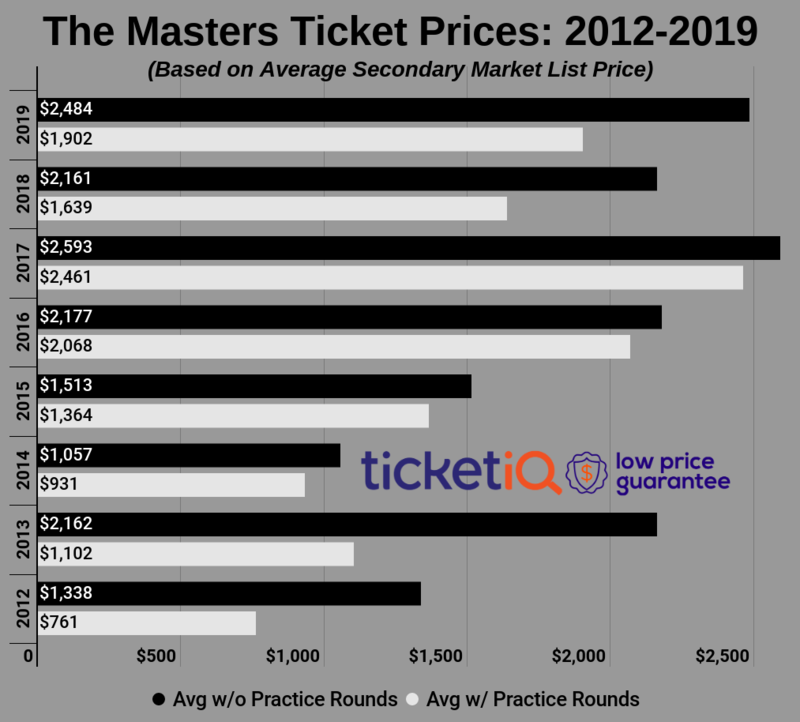 With the specter of Woods returning to Augusta, ticket prices for tournament on the secondary market are high, according to data from TicketIQ.com. Woods has played in 20 Masters Tournaments, the most recent in 2015, when the average price of a tournament for a single-day ticket (not including practice days) was $1,513.46. That number was down from $2,161.72 in 2013 when Tiger was in the mix on the weekend, ultimately finishing tied for fourth. But those numbers are low compared to the current average asking price for a single-day ticket on the secondary market for the 2018 edition – a whopping $2,948.42. A week-long tournament badge is currently priced at $9,950. Last year, the price to walk outside the ropes for a week cost fans an average of $3,721.71, but the last time Tiger played – in 2015 – that number was $5,605.86. As the tournament approaches, fans will find the best deal for the first practice day (Monday), according to TicketIQ.com, for which the average asking price is $722.98, but all of the players aren’t typically on site in time for that first round. The average asking price jumps to $1,154.90 to Tuesday and $2,041.58 for Wednesday, the day of the annual Par-3 Tournament. The highest-priced ticket on a competition day is currently $4,837.42 for Thursday and it falls off through Sunday – though prices will likely head back up again once the field is set, when Tiger commits (or doesn’t), and even during the tournament, when it’s clear who will contend. Whether Tiger will play or not, just the speculation that he will is enough to get fans excited. Woods won the Masters in 1997, 2001, 2002 and 2005, tying him with Arnold Palmer for the second-most victories. Jack Nicklaus won six.